This "dictionary" is an attempt to inform fellow scripophilists about the meaning of several terms used in our hobby. What, at first sight, may seem a confusion of tongues (In Dutch: een Babylonische spraakverwarring), becomes more understandable when we consider the linguistic history of these terms, the etymology. This dictionary is the work of an amateur in linguistics. Therefore your contributions and remarks would be greatly appreciated, especially the correction of any faults and mistakes, also in the English or other languages used. Have fun ! and give here your comments. One Swedish collectors club is called Svenska Foreningen for Historiska Vardepapper. Dutch for historic stocks (bonds and shares). The name of the Dutch collectors club is Vereniging van Verzamelaars van Oude Fondsen. One Portuguese collectors club is called Associacao Portuguesa de Coleccionadores de Papeis de Valor. See an example from Bolte & Gorter NV, Groningen The Netherlands: Recepis voor 1 aandeel f 1000, 1950. The holder of this piece is entitled to receive without costs one share of f 1000, once notice is being given. I take it that the word "scrip" originally stems from the Latin word "scribere", meaning "to write". However, this does not completely explain the current meaning of the word "scrip". The word "scrip" is used in English and also in Dutch. One Dutch dictionary says it is an English word, however (see below for the French / Flemish equivalent "script"). The word "scrip" is used in many senses, related to the stock market, and we will list here different meanings of the word. The word "scrip" is short for "subscription receipt" (and sometimes loosely used for "shares") (says the IBSS Journal Yr 19 No. 1 p. 7). I was told by a Dutch stock broker that the word scrip refers to a fraction of a share, which, for example, emerges from a stock dividend (also called scrip-dividend, according to the Great Dutch Larousse Encyclopedia). 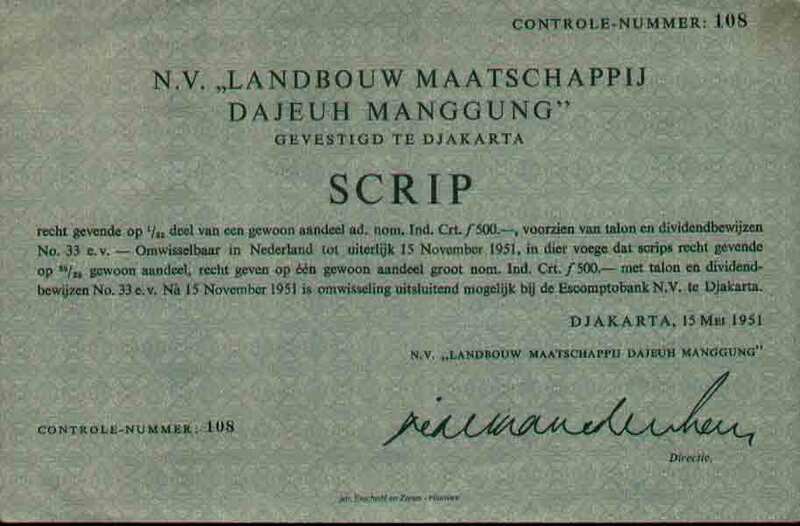 See for an example the scrip from 1951 of the Djakarta based Landbouw Maatschappij Dajeuh Mangung. 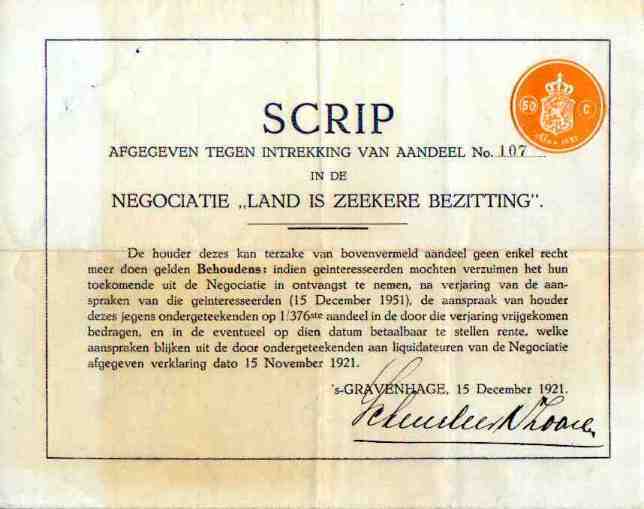 But a Dutch Scrip, mentioned below (of the Negotiatie "Land is Zeekere Bezitting"), is a certificate, received by the shareholder, after the shares have been withdrawn, and which gives the right to revenues or assets not claimed within 30 years by those having rights to revenues from the withdrawn shares. 3) evidence of interest not having been paid out, in case a company cannot pay bondholders out, due to a lack of funds. Another Dutch dictionary says: a preliminary evidence of a share. (source: Wolters' kleine woordenboeken: Engels-Nederlands). In this sense the Recepis from Bolte & Gorter, Groningen, The Netherlands, was issiued: Recepis voor 1 aandeel f 1000, 1950 , Recepis is the Dutch translation of scrip. The holder of this piece is entitled to receive without further costs one share of f 1000, once notice is being given. I think, I read somewhere that "scrip" also may refer to a physical package of shares. Is that correct ? This scrip is given in exchange of a redrawn share. It gives the right to 1/376th of the amount that will not have been reclaimed after 30 years by persons still having a right to collect money on the basis of their shares. So, I suppose some shareholders may never show up and those uncollected revenues will be shared by the other scrip holders.This is different from just a fraction of a share that emerges from a stock dividend. SCRIP was the name of a scripophily journal. In the early 1980s it was incorporated in the journal "Friends of Financial History"
I was told by Geerd Haayer (Styx Publications) that the "0" between "Scrip" and "Club" must have been inserted for euphonic reasons: it just sounds better and is easier pronounced than "Scrip Club". A collector of historic stocks and bonds; I found the word for the first time when used in The Netherlands on a fellow collector's "hobby card". Equivalent of the English "scripophile". There was once (and may be still) an Asociazone Italiana Scripofili (An Italian collectors club). The name of the Norwegian collectors club is Norsk Selskap for Scripofili. A collector of historic shares and bonds. Equivalent of the English "scripophilist"
The word was used already in 1792 to indicate irresponsible investor behaviour, in this case gambling in claims of the Bank of the United States of America (Bower, 1925, p. 87; cited by Winter, 1933, p. 137). The scripomania took the following form: "Stock and scrip are the sole domestic subjects of conversation;.....speculations carried on with money borrowed at from 2,5% a month to 1 % a week"
I am not a linguist,but a psychologist. So, with some authority, I can say that a person, who's activities in the hobby of scripophily have become so intense that this becomes detrimental to his social life or financial position, should be called a scripomaniac, and the syndrome scripomania. Brian Mills, in his correspondence with me, puts it more mildly: he suggests to reserve this term for "advanced scripophilists". The word is used in the name of the Swiss collectors society "Scripophila Helvetica"
certificate......etc". I'm still not sure what the word exactly means. I found the word used in this sense in a recent issue of the IBSS Journal, used by member Herb Hackenberg. "philos" refers in Greek to "to love", or, "to have an affinity with". In the new Greek dictionary (not in the Homeric one) I found another meaning: doing something by preference, having a habit. So, a "scripohile" would be a person, having an affinity with scrips, or a preference for scrips, but also one having a habit in doing something with scrips. We may draw a parallel with the word bibliophile for someone with an affinity for books, or book collector. Nevertheless I personally prefer to use the word "scripophilist". A collector of historic stocks and bonds; I found the word used in this sense in the Nov. 1998 issue of the IBSS Journal, where reference was made to Arthur Howell. It is a word widely used indeed. From Geerd Haaijer (Styx Publications) I learned that the word-ending "istos" stands in Greek for a person doing something, or, being actively engaged in something. Think of pianist or journalist. So, I suggest that the word "scripophilist" refers to a person being actively engaged with the hobby coined "scripophily". It brings together the English (!) word "scrip", the "o" for euphonic reasons, "phil" from the Greek "philos" and "ist" from the Greek "istos". Therefore, the word "scripophilist" expresses - in my opinion - more strongly the aspect of being activily engaged with the hobby called scripophily, the name of which already contains the aspect of affinity for scrips. So I vote for "scripophilist", when referring to a collector of historic stocks, rather than "scripophile". Also used as adjective, such as in "......"
By now the world wide accepted name for the hobby of collecting historic bonds and shares. In the IBSS journal Yr 19 No 1, p. 7 it is explained how the word scripophily was coined by Arthur Howell in the course of a contest in the Times in 1978, and how it is built up, etymologically, from "scrip", short for "subscription receipt" (and sometimes loosely used for "shares") and the Greek "philos", loving. I was told by Geerd Haayer (Styx Publications) that the "0" between scrip and phily must have been inserted for euphonic reasons: it just sounds better and is easier pronounced than "scripphily". Some people have difficulty in pronouncing this strange word "scripophily". I'm not sure if they are really helped by the suggestion, I recently found on the internet, to pronounce it as "scrip-awfully", but then I am only a Dutchman ! Ha! Well, may be the International Bond and Share Society should provide appropriate phonetic guidelines for its members. 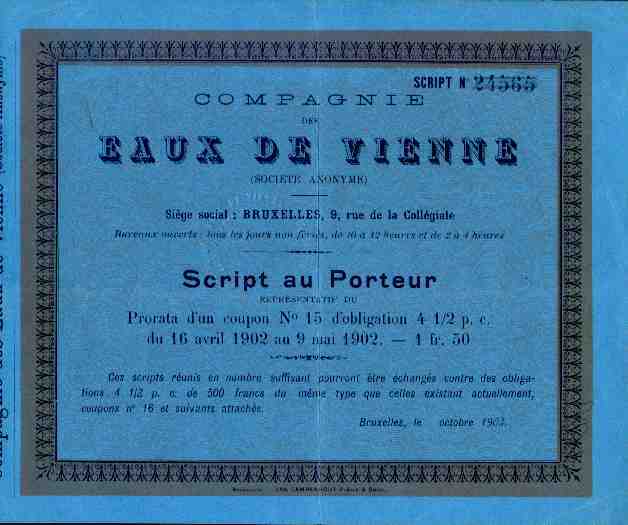 The French word is used for similar items as the English word "scrip"
Example: script of the Compagnie des Eaux de Vienne, Brussels 1903. The word apparently stems from the word "script" like the word scripophily stems from "scrip". The word is found in the name of the Belgian collectors socitey, which has a French and a Flemish name: Association Belge de Scriptophilie / Belgische Vereniging voor Scriptophilie. French for "historic titles" or "historic securities". French for "financial titles" or "financial securities". Brian Mills, Chairman and Editor of the International Bond and Share Society, for his "catching" correspondence with me about these matters. The idea for this page would not have emerged otherwise. Geerd Haaijer, Styx Publications, The Netherlands, for his etymological explanations concerning the words "scripofilist" vs "scripofiel", in English "scripophilist" vs "scripophile" and other matters such as the euphonic "o" in scripophily. Paula Wassenberg, Groningen, for digging up the word "scrip" spontaneously in several Dutch dictionaries and encyclopedias when she learned about my search. Ruth Rosenthal, Israël, for correcting several spelling errors. The remainining ones are my responsibility.